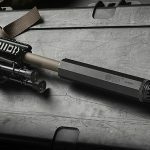 AAC Ti-Rant 9M: This year, Advanced Armament Corp. (AAC) has rolled out the Ti-RANT 9M, its second modular pistol suppressor behind the 45M model. 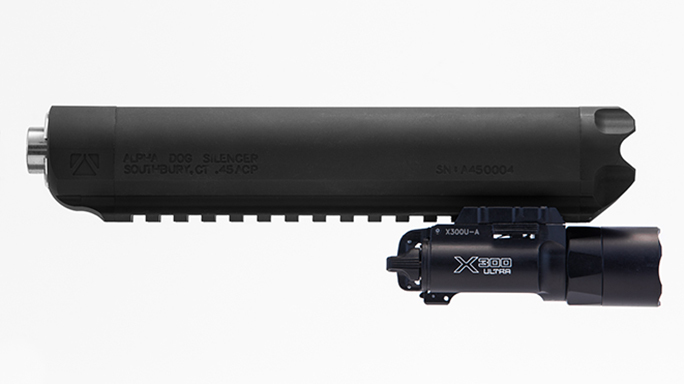 Here modular means the suppressor can be shortened from its original length for compactness with, of course, a louder signature as a tradeoff. Like the 45M version, the 9M is also user serviceable. The 1.38-inch-diameter unit can used in two configurations: 8 inches long and weighing 9.5 ounces or, by removing the end section, 5.84 inches long and 7.75 ounces. The dry sound attenuation is 32 and 21 decibels for the long and short configurations, respectively. The Ti-RANT 9M is made with a stainless steel blast baffle, an anodized aluminum front module and secondary baffles, and a titanium main tube. 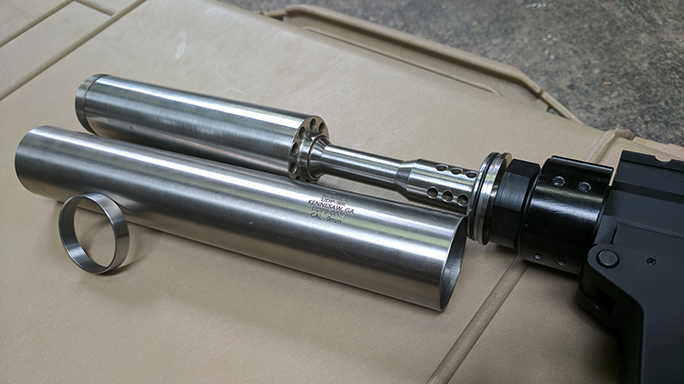 The tube is finished with Cerakote, and the full-auto-rated unit comes with two pistons for different threaded barrels. 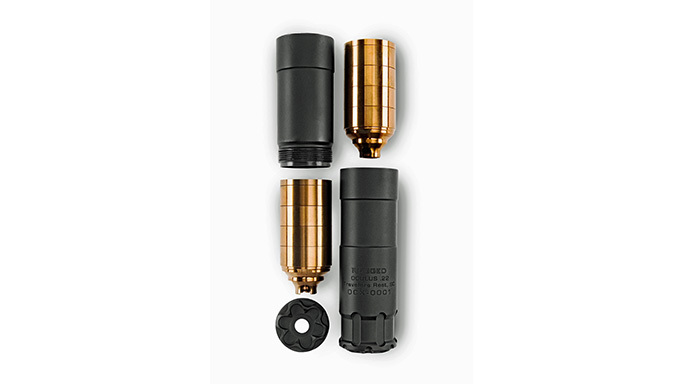 Alpha Dog: The Alpha Dog is a centerfire pistol suppressor with a couple of unusual twists. 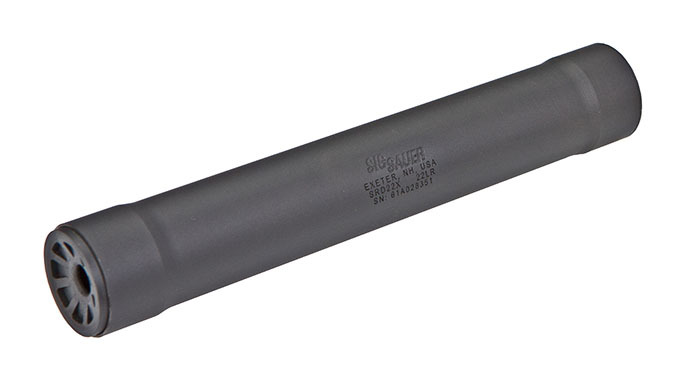 Designed for 9mm, .40 S&W and .45 ACP weapons, this suppressor has a distinctively shaped tube with an integral Picatinny style rail for mounting a light or laser (for pistols without a rail) and to possibly help dissipate heat. The rear end of this rail also functions as an open sight while up front is a post-type sight integral to the end cap. 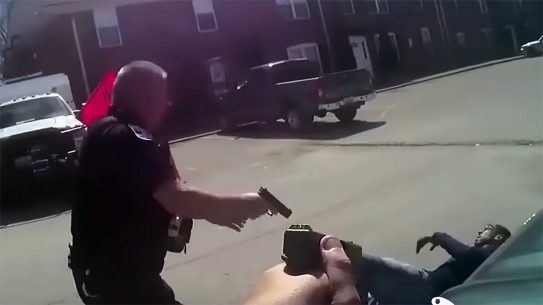 These three-dot sights make aiming much easier when mounted on a pistol that lacks suppressor-height sights. Users can orient the position of the rail to 12 different positions. The Alpha Dog also has a specially shaped end cap intended to protect the unit if dropped muzzle down. Inside the can is a V-shaped monocore made from 7075-T6 aluminum and coated with Teflon for easier cleaning. 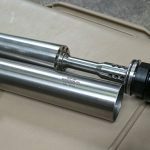 This sound suppressor also has a stainless piston and housing that is pinned to the tube so that the housing does not unscrew itself from the tube when the suppressor is removed from the barrel. 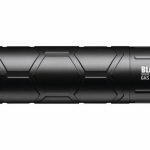 BlackHawk Gas Can: BlackHawk is a brand better known for its tactical clothing and holsters, but it recently announced a line of suppressors for pistols and rifles up to .338 Lapua Magnum. 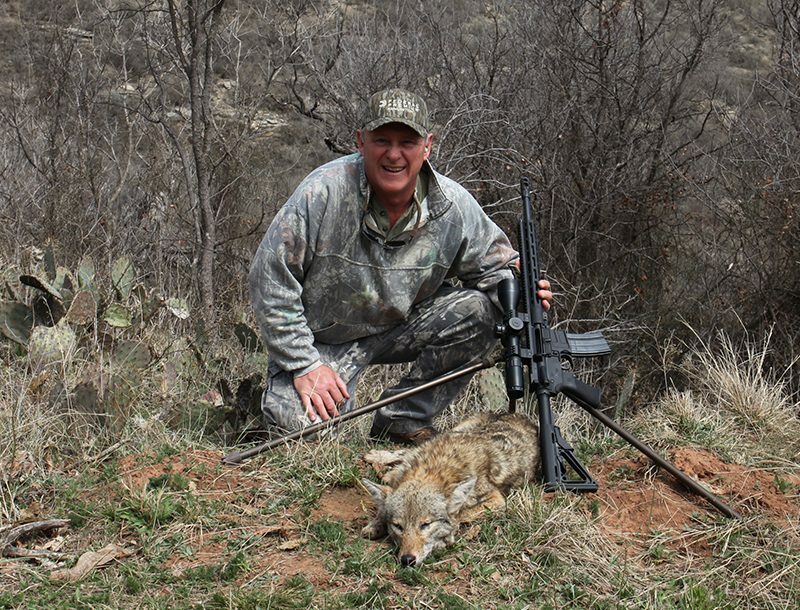 The company now offers several models for rimfire and centerfire weapons, and they all use aluminum tubes and carry a lifetime warranty. 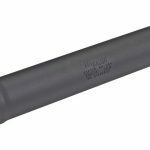 BlackHawk promotes the 7.62mm Gas Can as its most versatile unit, and it’s probably the most durable with baffles constructed of abrasion- and heat-resistant Stellite, Inconel and stainless steel. It carries a full-auto rating and mounts directly by 5/8×24 threads or to an included muzzle brake with a ratchet-type QD attachment. 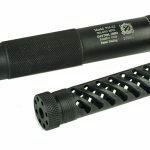 AMTAC Hornet: AMTAC has introduced a new 9mm suppressor specifically for pistol-caliber carbines. 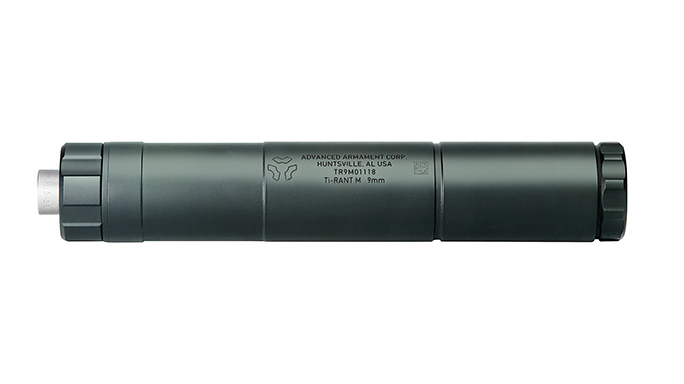 Like other AMTAC designs, the Hornet is a reflex design where the suppressor fits over and around the barrel and gas is discharged inside the can to the front and rear of the muzzle. 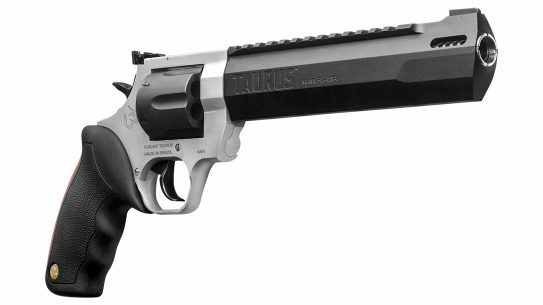 This design allows for significant volume but does not add much length the barrel—only 4 inches despite the Hornet’s overall length of 7.7 inches. 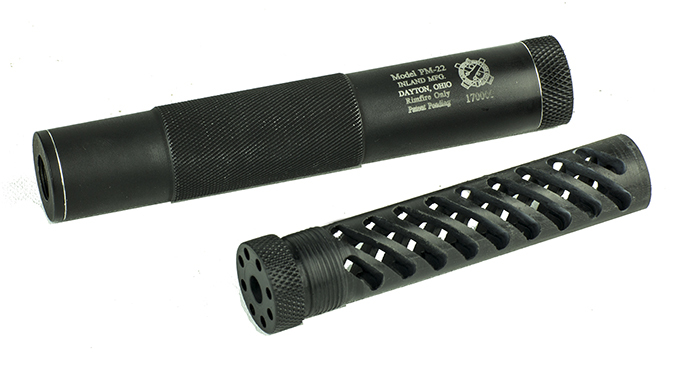 The suppressor mounts directly to barrels with a diameters no greater than 0.75 inches. The Hornet also uses a durable monocore made from a single rod of 17-4 precipitate-hardened stainless steel surrounded by a Cerakoted stainless tube 1.62 inches in diameter. The unit weighs 16.6 ounces and has a sound reduction rating (SRR) of 30 decibels. Angstadt Arms UDP-9i: The UDP-9 is a high-quality AR dedicated to using Glock magazines. Angstadt Arms offers pistol, SBR and carbine variants, and has recently unveiled an integrally suppressed version with a suppressor from KG Made. The UDP-9i is different than most integrally suppressed firearms because it has 15 small gas ports ahead of the chamber that can be set to bleed gas off the barrel and into the suppressor, thus allowing a shooter to reduce supersonic ammo to subsonic velocities for quieter operation. 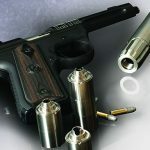 The gas ports are adjustable with an Allen wrench, and the unit has a vented blast chamber intended to eliminate first-round “pops.” This weapon is full-auto rated and is made with 17-4 PH stainless M-type baffles and a titanium tube. 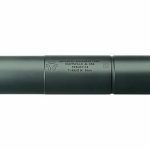 Dead Air Wolverine PBS-1: Sound suppressors specifically designed for former Soviet weapons are a rarity for several good reasons, including variability and quality control in barrel threading and design aspects of rifles like the AK-47 that limit their ability to be made quiet. 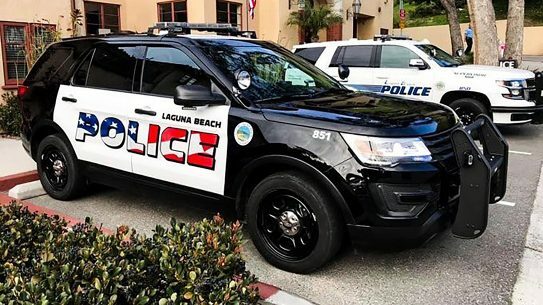 But that’s not to say that the muzzle signature from these weapons can’t be diminished, and the new Wolverine PBS-1 is built for AKs, Krinks, etc. The Wolverine fits mounts with threads and locks tight to the AK’s front sight block pin. 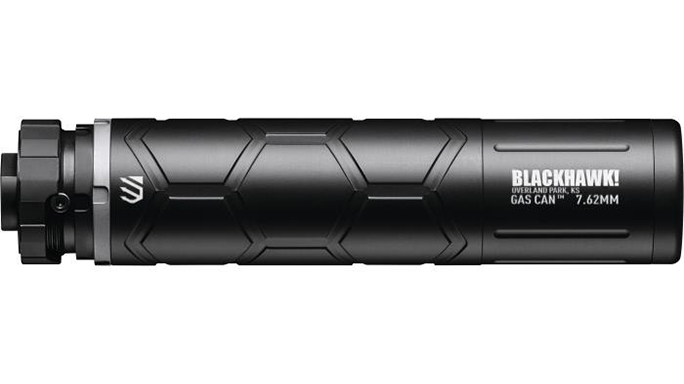 Constructed with a stainless steel tube and baffles, this suppressor is durable enough for full-auto fire and has no minimal barrel restrictions. 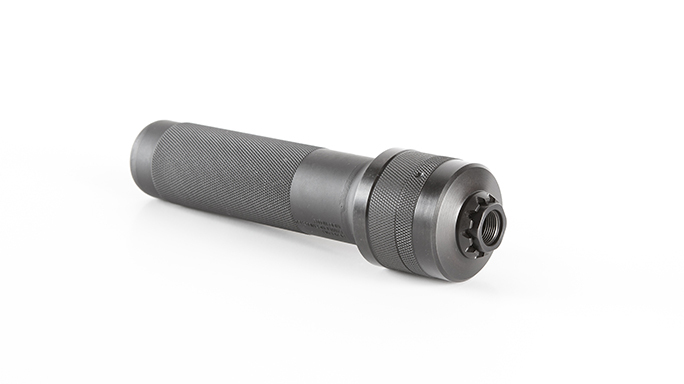 It can also be used on AR-15s by swapping the thread insert. 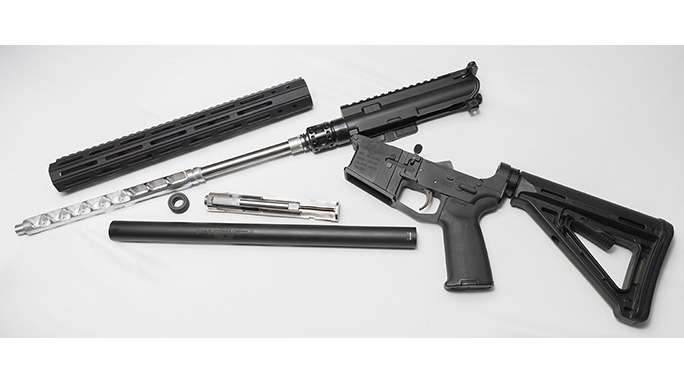 Freedom Armory Minuteman: Those who want a high-performance and very lightweight suppressor for .22 LR up to 5.7x28mm weapons should consider the Minuteman from Freedom Armory. 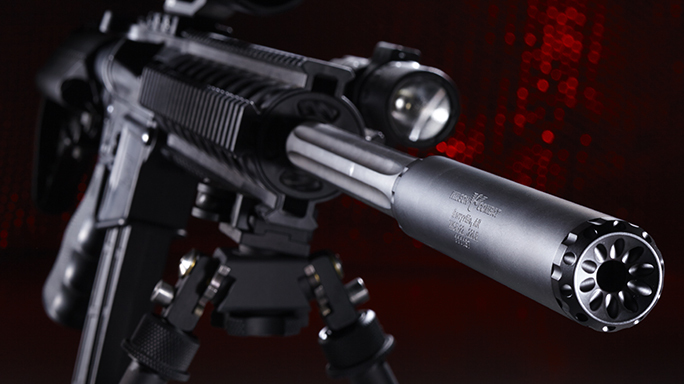 This suppressor is 100-percent titanium and weighs only 3.9 ounces yet delivers an SRR up to 42 decibels. 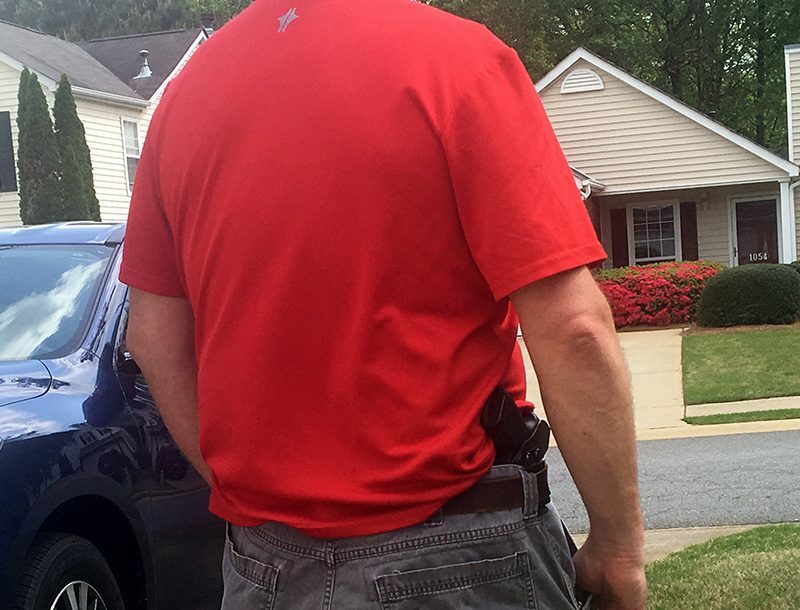 The Minuteman is 6 inches long and uses six baffles that can be rotated to different positions by the user to adjust or optimize the sound report on different handguns and rifles. The Minuteman is full-auto rated for .22 LR weapons. 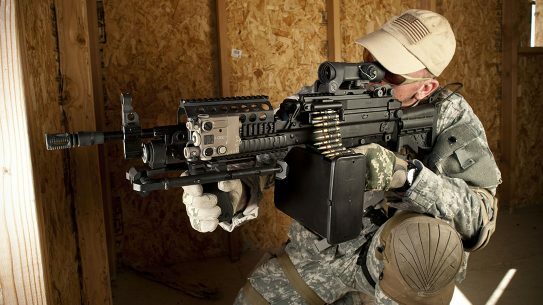 Freedom Armory Dragoon: Freedom Armory also makes the Dragoon series for 5.56mm and 7.62mm rifles. 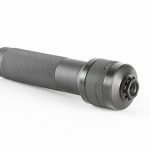 Each chambering is available with a direct-thread or a QD mount. 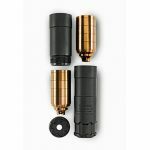 Made of titanium, Dragoon suppressors are built differently than most centerfire models because they can be dissembled, and the tube is milled out of solid titanium. The solid titanium construction makes for a weld-free area where the mount is installed. 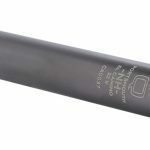 Hailey Ordnance AeGIS: Integral suppressors for the Ruger 10/22 rifle are nothing new, but the AeGIS suppressor from Hailey Ordnance is far more advanced that most others. 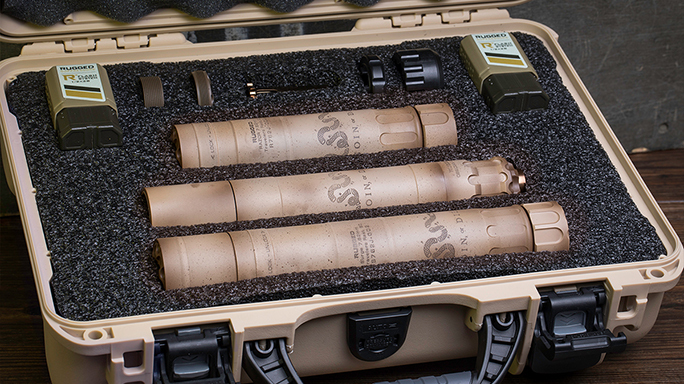 AeGIS stands for “Adjustable Gas Integrated Suppressor.” This unit allows the user to bleed gas off of the barrel to reduce velocity to subsonic levels, for instance, for more quiet operation and to tune the ballistics from a variety of ammunition. 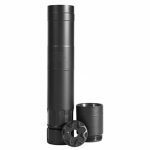 The AeGIS uses a match-grade Lothar Walther barrel pinned to an aluminum monocore suppressor with a steel insert on the first three baffles, and a 0.91-inch-diameter stainless steel tube. 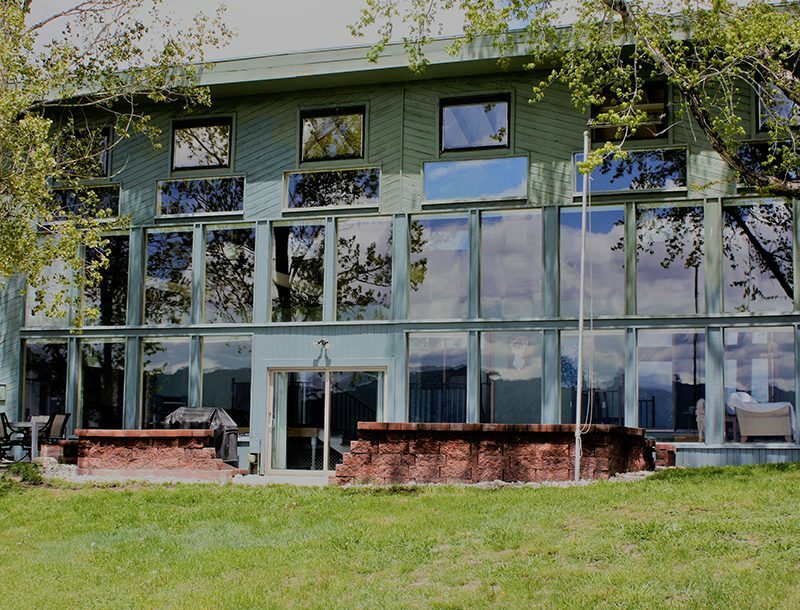 The overall length is 23 inches, and it weighs 19.5 ounces. 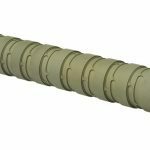 Inland PM-22: Inland is best known for making reproduction M1 Carbines, but now the company is offering its first sound suppressor and an interesting ablative foam for increased sound reduction. 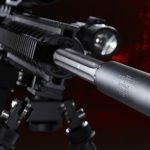 The PM-22 sound suppressor is designed for rimfires, and weighing 3.3 ounces due to its polymer monocore and aluminum tube, it could be the lightest suppressor commercially available. 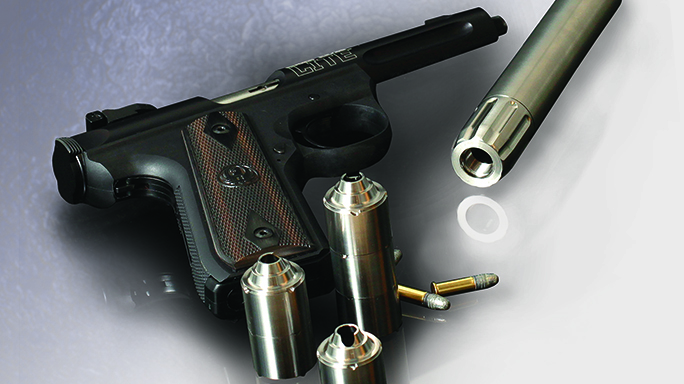 The PM-22 is just under 1 inches in diameter and has a stainless steel threaded base. 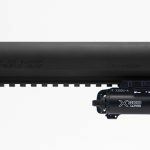 OSS HX Magnum: Operators Suppressor Systems (OSS) has expanded its Helix line to include the HX Magnum, a rifle suppressor that can handle anything from the 5.56mm to the .338 Lapua. Built with OSS’ patented Flow-Through technology, the HX Magnum has an integrated flush mount and is full-auto rated. 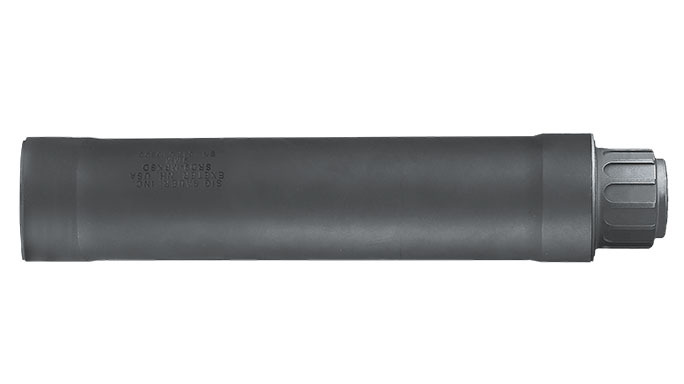 The suppressor is 8.37 inches long and weighs 25 ounces. It’s constructed with stainless steel, cobalt and titanium, and mounts with OSS’ STS-Muzzle Brake—a suppressor mount and fully functioning muzzle brake that self-tightens during fire. 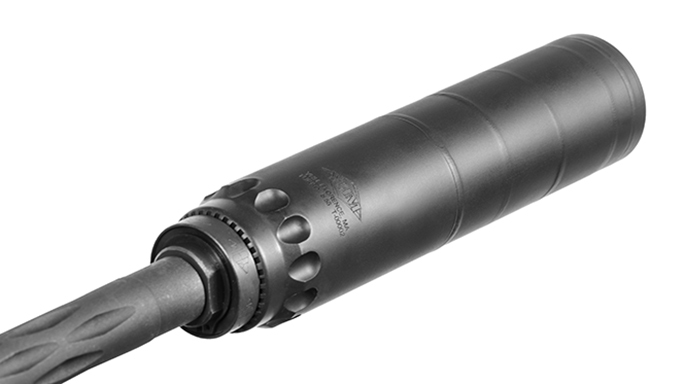 Rugged Surge 762: Of the models Rugged Suppressors offers, the modular Surge 762 is the flagship. 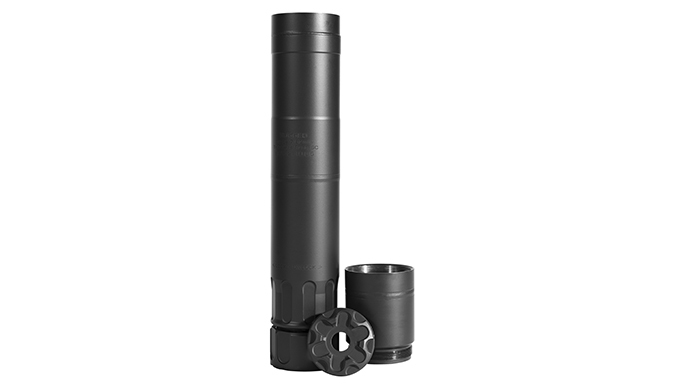 Designed for sustained fire on belt-fed full-autos, this suppressor is made with a fully circumferentially welded core of Stellite baffles, a 17-4 stainless steel mount and a 316L stainless tube. Users can configure it in full length (9 inches) or unscrew the front section for a more compact 7.5 inches. It mounts with a flash suppressor or muzzle brake. 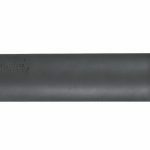 This suppressor is rated for 7.62mm NATO to .300 Remington Ultra Magnum belt-fed machine guns with certain minimal barrel lengths. Rugged Oculus 22: The Oculus 22 is designed for .22 LR to 5.7x28mm weapons. 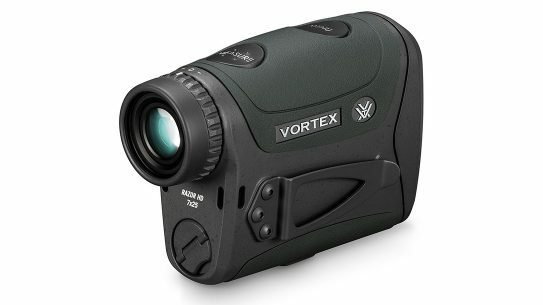 Full-auto rated, the Oculus is modular with a long/short length of 5.25/3.25 inches and a weight of 6.9/4.3 ounces. The baffles, tube and mount are all made from 17-4 PH stainless steel. 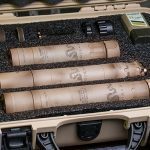 Rugged Join or Die: Finally, for those who want a collectible set of Rugged’s best sellers, Silencer Shop is selling a cased set with a very distinctive custom Cerakote finish with the Revolutionary War “Join or Die” snake by Blowndeadline. 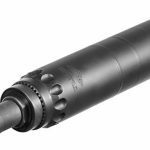 Q Suppressors Erector: Q is a new and curious company name in the suppressor industry, but the design and management team, led by Kevin Brittingham, has decades of experience from AAC and Sig Sauer. 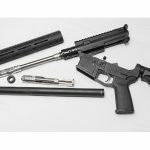 Q makes for four suppressors for .30-caliber rifles up to .300 Winchester Magnums and two cans for rimfires and 5.7x28mm weapons. The rifle units all have 1.75-inch-diameter, tubeless welded designs and are either made of titanium or Inconel. 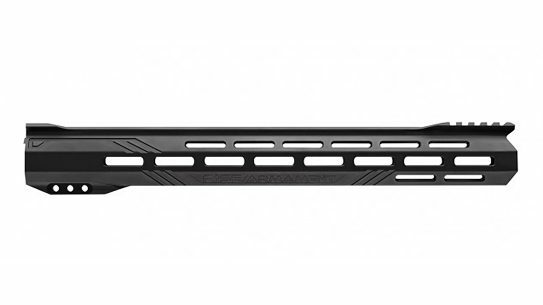 The rimfire Erector has a tubeless design with 10 removable baffles that screw together. The Erector can be used in full-length configuration or shortened one section at a time. 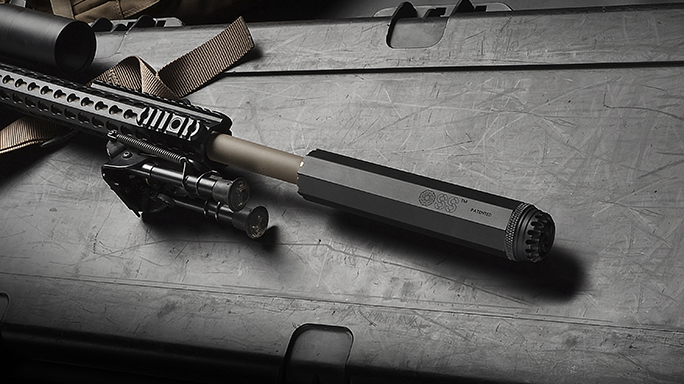 Q Suppressors El Camino: Made of stainless steel with a titanium tube, the rimfire El Camino is 0.95 inches thick, 5.95 inches long and weighs 4.3 ounce. The end caps on both can be unscrewed with a 0.5-inch socket wrench, which helps break loose fouled baffles. 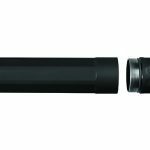 Sig Sauer SRD22X: This year Sig Sauer has improved upon its SRD22 suppressor with the SRD22X, which has an internal sleeve that holds the baffle stack and prevents soot and lead from adhering it to the tube walls. 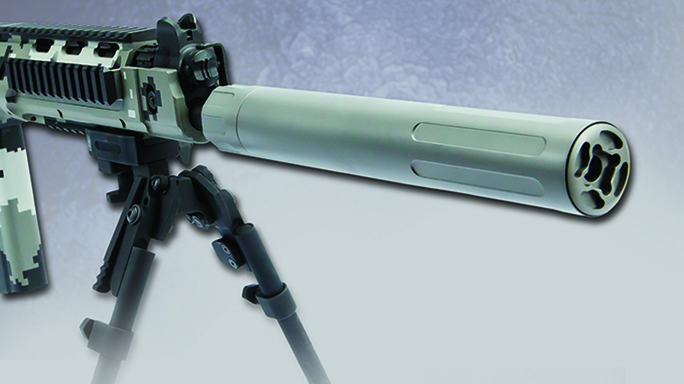 The SRD22X has a removable K-type baffle stack and a titanium tube. It’s 5.8 inches long, weighs 5.8 ounces and measures 1 inch in diameter. 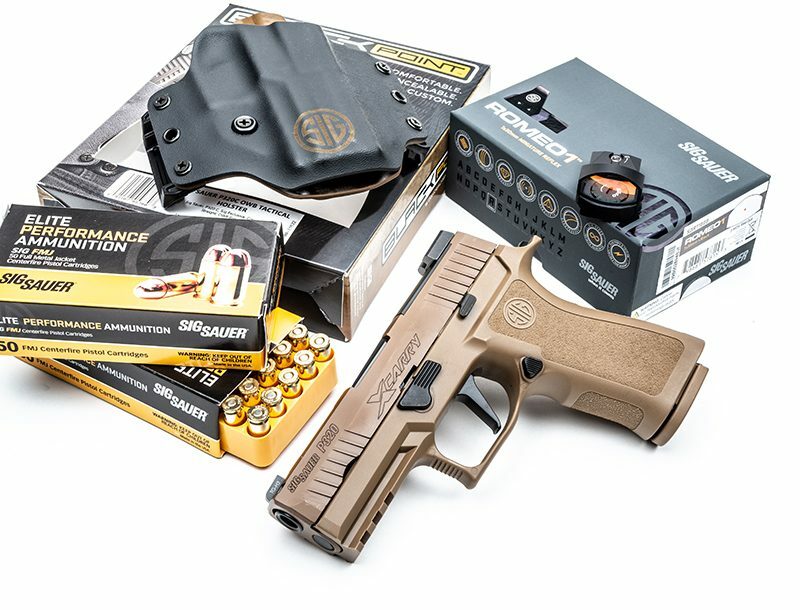 Sig Sauer SRD9: The 9mm SRD9 features a titanium tube and 17-4 PH stainless steel cup-type baffles for heavy use, and it comes with two pistons for the most popular thread pitches. The SRD9 can be disassembled for cleaning or baffle replacement. It’s 7.2 inches long, 1.375 inches in diameter and weighs 9 ounces. 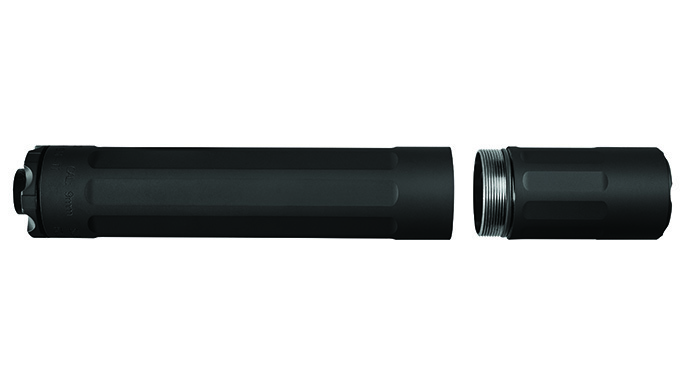 SureFire Ryder 9-MP5: This year SureFire has adapted its Ryder 9 suppressor for use with HK MP5 submachine guns, connecting to the MP5’s tri-lug barrel using a quick-detach mount. The Ryder 9-MP5 is made with a titanium tube and end caps, stainless steel cup-type baffles and a spacer. Everything is removable for cleaning or replacement. Reassembly is aided by the numbers and notches included on each baffle. An assembly/disassembly tool that removes and reinstalls the baffles as a single-stacked unit is also included. The SureFire Ryder 9-MP5 is 9 inches long, 1.3 inches in diameter and weighs 15.4 ounces. 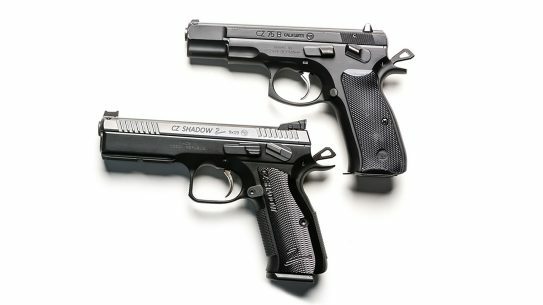 Several Cerakote finishes are available. Wilson Combat WCR-22: Besides being one of the largest makers of custom- grade 1911s and ARs, Wilson Combat also offers Whisper centerfire suppressors and WCR-22 rimfire suppressors. 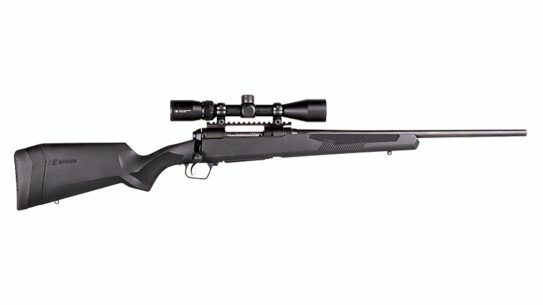 While the Whisper series is available in five different chamberings, all with Wilson’s Armor-Tuff finish, the WCR-22 uses a 7075-T6 aluminum monocore, a stainless steel thread mount and a titanium tube finished in any of five Armor-Tuff colors. 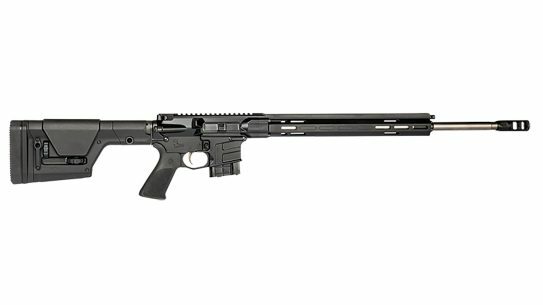 The WCR-22 is full-auto rated for .22 LR and .22 WMR weapons. It’s only 4.2 ounces, 1 inch in diameter and 6 inches long, and it can easily be disassembled for cleaning with a supplied wrench. 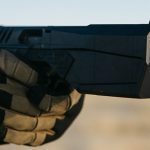 SilencerCo Maxim 9: The long-awaited Maxim 9 suppressed pistol is finally shipping. 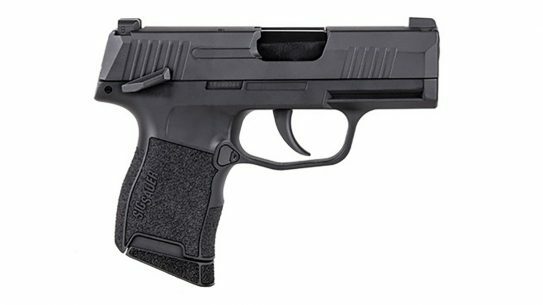 The Maxim 9 is a striker-fired pistol that hold 15+1 rounds of 9mm ammo and is configurable into two lengths: 9.45 or 10.75 inches. Though this weapon system rightfully gets lots of attention, the more unconventional aspect is the pistol itself rather than the suppressor, which uses a fixed, un-ported barrel that protrudes into the blast baffle and has twin recoil springs located behind the barrel chamber. The grip is also extremely comfortable with imaginative yet completely functional styling. 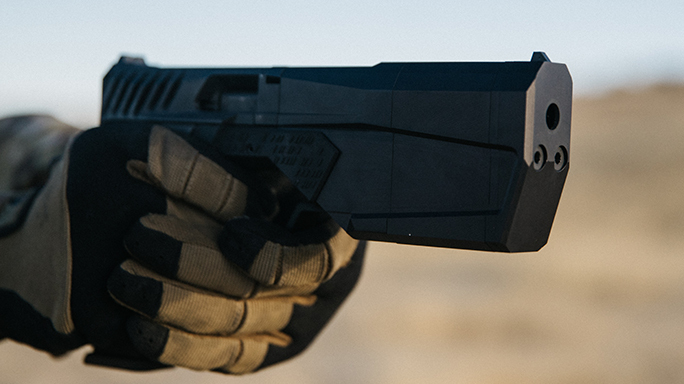 The suppressor baffles can be disassembled for cleaning, and the Maxim 9 comes with a Kydex-style holster with active retention. YHM Turbo 5.56: Yankee Hill Machine (YHM) makes pistol, rifle and sub-machine gun suppressors, and its newest release is the Turbo 5.56. The Turbo 5.56 is a tubeless design where the baffles are fully welded together without an overlapping sleeve. 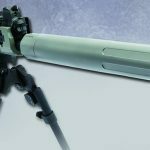 This is the technique rifle suppressors are trending towards because it saves weight and costs, but it does require careful welding. The Turbo 5.56 is made with an Inconel blast baffle followed by 17-4 PH stainless secondary baffles. It’s 6.5 inches long and 1.56 inches in diameter. This can mounts onto an included brake and weighs 13.5 ounces. 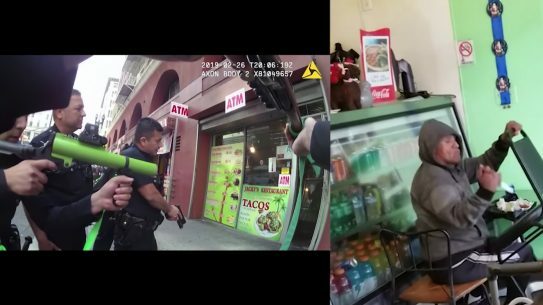 Using a 5.56mm with a 14-inch barrel, the rated average sound is 134 decibels. 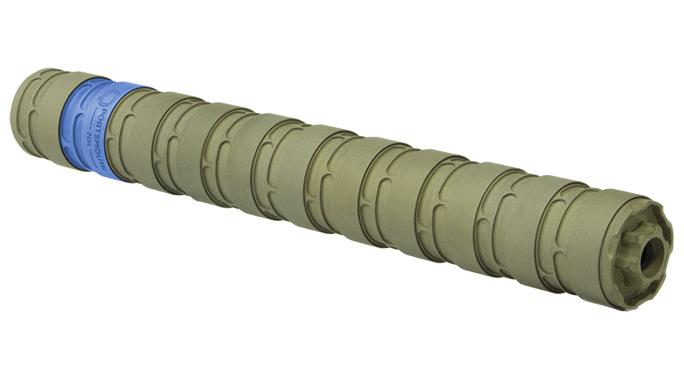 Sound suppressors are becoming more and more popular because of all the benefits they offer shooters. They protect your hearing, won’t spook game and will certainly improve your relationships with your neighbors. 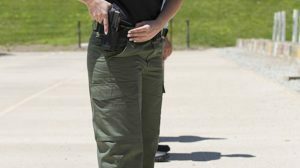 Though they still fall under the National Firearms Act (NFA) and consequently are much more regulated at the federal level than most firearms (and come with a $200 transfer tax on each unit), suppressors are legal to own in most states. 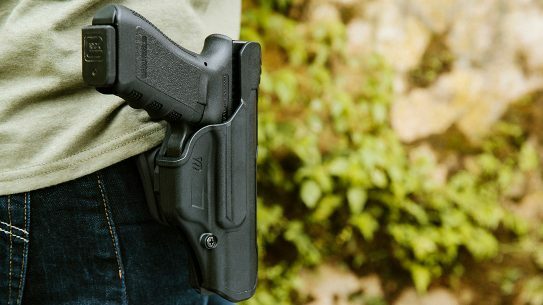 Moreover, there’s hope with the new Congress and Trump administration that the ultra-restrictive NFA requirements will be removed if the Hearing Protection Act becomes law. 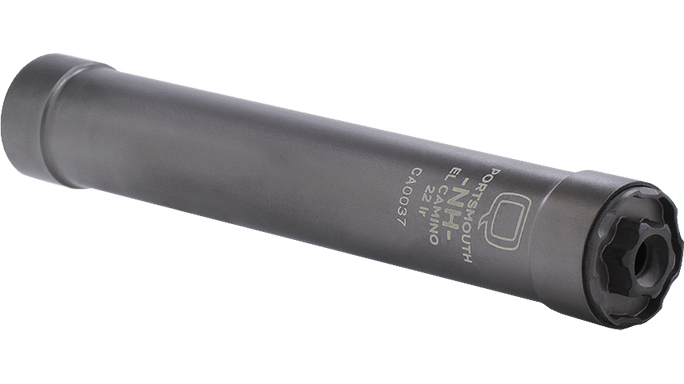 To that end, let’s look at some of the more noteworthy new suppressor models hitting the market in 2017. For more information about the new suppressor models featured in the gallery above, visit the following sites. Propper has released the RevTac, a fresh, modern take on its classic Lightweight Tactical Pant.